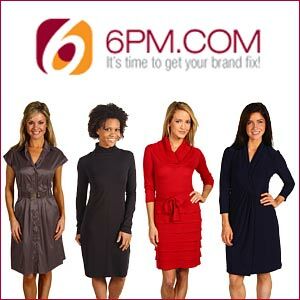 6pm.com is an online clothing outlet with a huge selection of discounted dresses. At the time of our visit, we saw more than 50 pages of dresses, with about 100 dresses per page! There are many styles, from little black dresses, to metallic sequined dresses, to ribbed dresses. Labels include Tahari by ASL, The North Face, Calvin Klein, DC, BCBGMAXAZRIA, BB Dakota, DKNYC, Free People, Hurley, Lucky Brand, Karen Kane, Three Dots, Roxy and more. An interesting feature of the website: there are short videos that accompany many of the dress descriptions. The media features models walking and turning so that shoppers may get a sense of how the clothing looks when worn. The website footer indicates that 6pm.com is operated by Zappos Development, Inc.
Corset dresses are a heritage from the Victorian times, and they have been reinvented many times over the past century. Today, corset dresses are worn as both lingerie as well as apparel. Corset dresses are a window to the good old days and also a modern clothes right now. It'll create wonders for your posture and figure the lovely figure which you always wish. You have given nice details of the website. I must visit it and hope that I could found something new there. I like to visit sites which have cheap rate and good quality clothes. Now its trend to buy cloths only if you looking for cheap bridesmaid dresses please visit Sexyher Dresses.